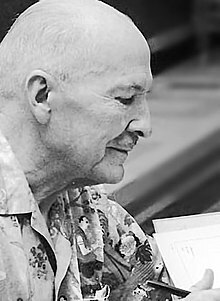 Robert Anson Heinlein (July 7, 1907 - May 8, 1988) was an American writer. He mostly wrote science fiction books. He won the Hugo Award four times. Probably his best-known novels are Starship Troopers (1959, Hugo Award, was made into a film), and Stranger in a Strange Land (1961, Hugo Award). Two other Hugo awards were for Double Star (1956) and The Moon is a Harsh Mistress (1966). Together with Isaac Asimov and Arthur C. Clarke he is seen as one of the Big Three of Science Fiction. This page was last changed on 24 January 2016, at 16:42.